The First Amendment of the Bill of Rights addresses five rights. The limits on government interference with religion, speech and the press were the result of the uniquely American experience. 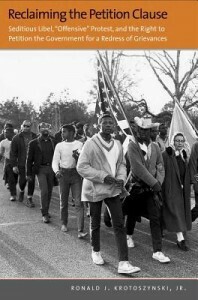 The right to peaceable assembly was a needed protection to exercise the first three. The First Amendment’s fifth right will come as a surprise to many. Only 1% of Americans even know that it exists. The Petition Clause has its own distinct history and English roots different than other First Amendment provisions. The Right to Petition has been, in many ways, the First Amendment’s poor relation. It may have been an early casualty as power accumulated in Washington. 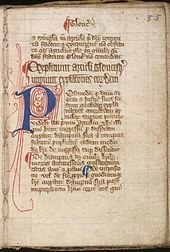 The Petition Clause finds its roots in Article 61 of the Magna Carta (1215). Article 61 provided for the presentation of grievances to the king, and required the king to redress grievances within 40 days or risk rebellion. The Magna Carta’s Right to Petition includes, if the right is abridged, the right to wage whatever war against government needed to get just redress. 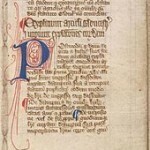 The Magna Carta’s Petition Right included a Right to Rebel in the event that the Right to Petition were abridged. What happened to such a crucial right in the almost 800 years since? While petitions continued to be addressed to the King, Parliament had in reality taken over both accepting and addressing petitions. The tradition developed that Parliament would respond to petitions with investigation and legislation. In the American Colonies petitioning became the act of submitting grievances to local legislative assemblies. By the early eighteenth century, Americans submitted a wide range of petitions to the locally elected houses of assembly. 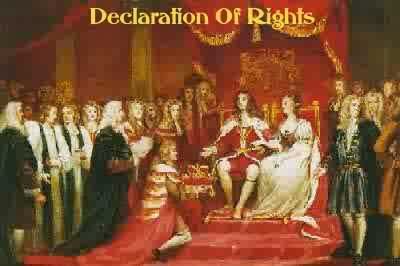 The balance of royal government in the colonies consisted of an executive, judiciary and an upper house appointed by the king. Petitioning the lower assembly for relief enhanced local authority, and local authorities took petitions seriously. Along with the right to petition was the right to consideration. Colonial petitions addressed a wide range of public and private subjects including religion and the established church, slavery, relations with Great Britain, debt (public and private), taxes, government structure, divorce, appeals from judicial decisions, and naturalization. Petitions frequently set the legislative agenda in the colonies and resulted in laws being passed. The Right to Petition was not limited to voters. Petitions were submitted by women, children and slaves. The elected bodies of the colonies understood their duty was to entertain the petitions of all. This was the background of petitioning when the Declaration of Independence was drafted. What was left? The Magna Carta outlined the response when Petitions for Redress were ignored: Rebellion. 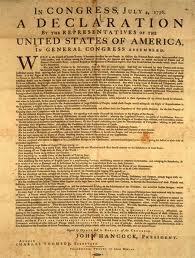 The Right to Rebellion defined in 1215 was exercised in 1776 and explained in the Declaration. This was the history of America as the First Amendment was drafted. The Right to Petition inherently includes the Right to a Response, and a government failure to respond triggers a Right to Rebellion. As Parliamentary supremacy grew in England it both received petitions and responded. The tradition of petitioning the legislature grew in the American colonies. Under the American Constitution, with government functions divided among three co-equal branches of government, legislative supremacy did not exist. Thus, the First Amendment’s Right to Petition the GOVERNMENT for Redress of Grievances grew from the history but was inherently different. The Petition Clause does not say Congress, the President or the Judiciary. The Clause includes all branches. The Constitution’s Article I vests legislative power in Congress; Article II, the “executive Power” in a President; and Article III “the judicial Power” in the judiciary. Article I, Section 8’s final clause describes a “government” of “powers vested” in three separate branches. The Petition Clause use of the term government acknowledges an individual’s right to invoke government’s “powers” by way of a petition for redress of grievances. The clause thus affirms the right to invoke the government’s “judicial Power” by petition for redress. With the Petition Clause comes a right to petition the judicial branch for redress of grievances against the government. 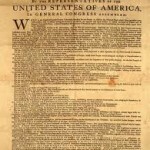 The Petition Clause created a constitutional right. Since less than 1% of Americans even know the Clause exists, it is not surprising that the right has been ignored by the government and largely trumped by the judicially adopted concept of “sovereign immunity”. The idea of Sovereign Immunity is that a government cannot be sued in its own courts absent its consent. The Petition Clause is at odds with that idea. The Petition Clause gives a citizen a right to sue the government for redress of grievances, but Sovereign Immunity says the government has to consent to such a suit. The idea of such immunity is inconsistent with both a republic and the Constitution itself. The Petition Clause is part of the First Amendment. Sovereign Immunity is found nowhere in the Constitution. The people through The Tenth Amendment reserve all power not delegated to the federal government. There should be no subject matter of a Petition for Redress that is dismissed by a court based upon Sovereign Immunity, nor kept from a decision by a jury.. The 800 year history of petitioning for redress found expression in the First Amendment. The Petition Clause acknowledges distinct rights separate and apart from religion, speech, press and assembly. There are no provisions of the Constitution meant to be without effect. The Petition Clause has come to be without effect because Americans have allowed it to happen. A 2006 survey by the McCormick Tribune Freedom Museum found only 1% of Americans know of the Right to Petition for Redress of Grievances and only 1 American out of 1,000 (0.1%) could name the five rights of the First Amendment. Among the offenses of King George outlined in the Declaration of Independence: “We have Petitioned for Redress in the most humble terms: Our repeated Petitions have been answered only by repeated injury.” This notes the right as one expected to be recognized by the King. The Right to Rebel was limited only by the duty to not molest the person of the king or his family. That is Parliament essentially became the place for subjects to petition the government and the source of redress. While petitions continued to have a form as if addressed to the King, the King was less and less the authority that answered the petitions. 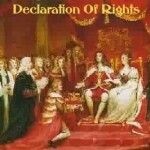 Acceptance of this “Bill of Rights” was a condition to King William and Queen Mary becoming the rulers of England and placed limits on their authority. Parliament and the King’s appointed officers in the colonies. Until the years before the Civil War, Congress routinely entertained citizen Petitions pursuant to the Petition Clause. The growth of petitions regarding slavery issues were an embarrassment to southern states and the House of Representatives adopted the GagRule. Though later rescinded Congress’ approach to petitions was changed. There are examples of waivers of sovereign immunity such as the Federal Tort Claims Act and the courts have allowed other kinds of suits that are actually against the government by naming as defendants government officers in their official capacity. None of this would be needed if the Petition Clause were applied as it was written. The same considerations should apply to officers and agents of the government. Why are prosecutors or judges immune from lawsuit for acts done pursuant to official duties even if a citizen is injured? All the legal arguments can be boiled down to: it’s inconvenient to the government to be challenged.